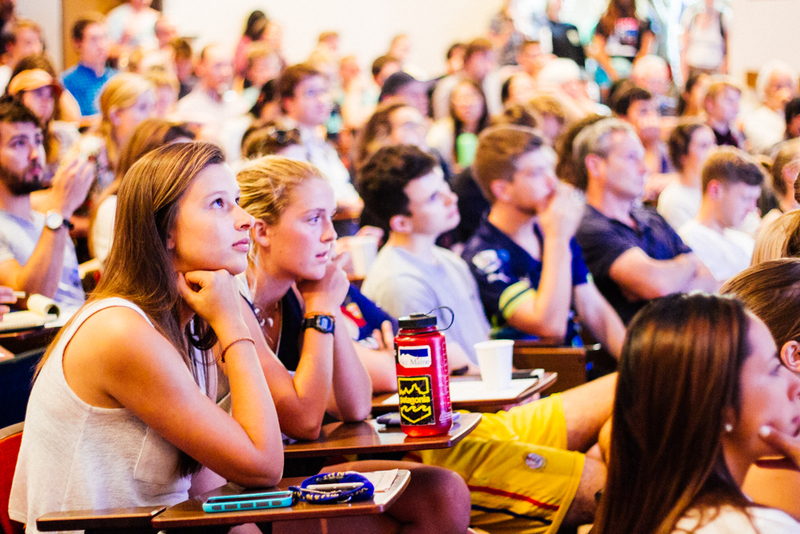 Live screenings of presidential debates have allowed more opportunities for Whitman students to contemplate how political rhetoric is an important component of American democracy. 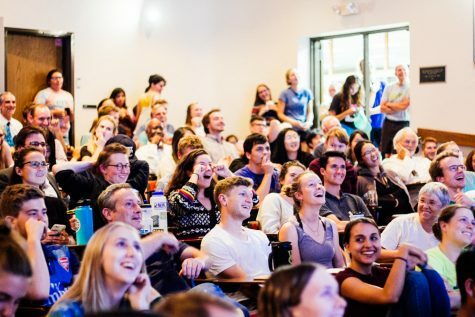 This year, the Politics and Rhetoric Departments teamed up to provide live screenings of the three presidential debates and one vice presidential debate. In the past, the Politics Department has done these live screenings by itself. However, Associate Professor of Politics Susanne Beechey and Assistant Professor of Rhetoric Heather Hayes chose to collaborate because they were both teaching courses on the 2016 elections this fall. Both are supplementing the debate in ways that relate to their respective fields. In the first presidential debate on Monday, Sept. 26, Hayes put up posters around Olin Auditorium to help students live tweet comments on logical fallacies the candidates used in the debate. Live tweeting also occurred at the vice presidential debate on Tuesday, Oct. 4. For the second presidential debate, Beechey will lead a discussion exploring which important issues the debate failed to cover. Students and professors alike concurred that both the disciplines of politics and rhetoric shed light on the workings of democracy. The professors hoped that combining knowledge from both fields allowed students to see not only which issues were being discussed, but how they were being discussed. 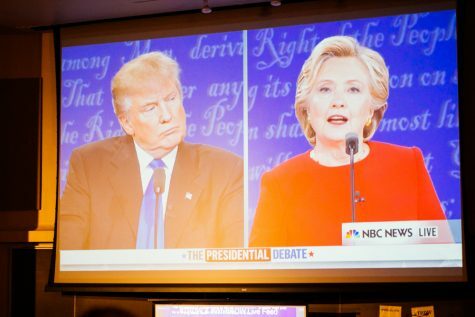 These hopes were realized as students applied what they had covered their politics and rhetoric courses to critique the first presidential debate. Olin auditorium, full of students, laughing at the spectacle that was the 2016 Presidential Debate. Photo by Henry Honzel. The goal of examining both the politics and the rhetoric behind the debates is to make students more passionate and knowledgeable about the workings of the government representing them. Presidential debates provide a special chance to do this because their trajectory changes in real time. “I see the debate viewing as an opportunity for students to come together and engage in a real, live political text. They get to see it unfolding in front of them. 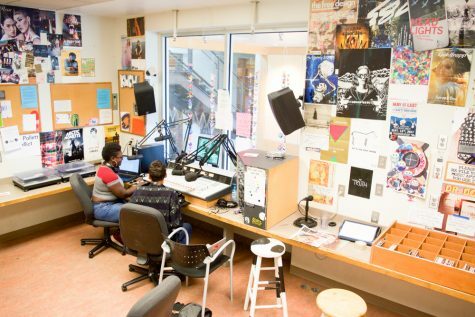 It’s an opportunity to apply all the skills and insights from their politics courses,” Beechey said. In order to effectively do this, citizens must understand the building blocks of those arguments. Part of engaging in democratic government is thinking deeply about how the ways that arguments are presented influence behavior. When this comes to a presidential election, this means reflecting on how candidates want citizens to engage with the world and whether citizens should agree with the plan of action the candidate has proposed. “At the end of the day, the candidates want us to act. They want us to go vote for them. So why should we? They use a lot of arguments and narratives and metaphors and symbols to try and convince us to do that. Critically analyzing those is a vital part of being an active citizen,” Hayes said. 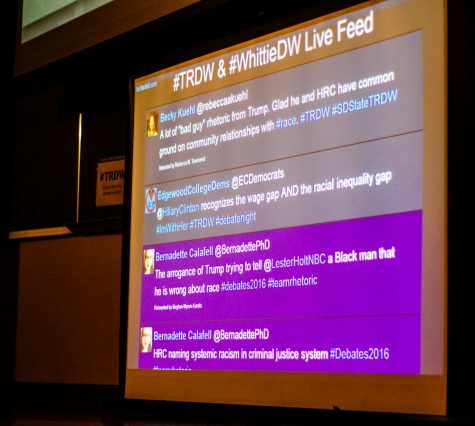 The live twitter stream projected below the debate allow the rhetoric programs of dozens of colleges to engage in conversation. Photo by Henry Honzel. According to Hayes, critically analyzing arguments is best done as a community so that citizens can remember their common goal as they try to work through the details of a difficult choice. “Democracy does not happen alone in our houses often. Democracy happens when we come together with other human beings…So seeing so many people [at the debate] was really exciting. All of us have one goal, which is [considering] who do we best think can lead this country we are a part of? And that’s one thing that unites all of us,” Hayes said. However, some students who had examined the point of debates from a political perspective doubted that the debates would unify people over a common purpose. Instead, they believed that the debates would serve to reaffirm the choices that voters on both sides had already made, pushing people further into the partisan spheres that undermine healthy democratic discussion. “Almost everyone knows who they are voting for at this point, and so debates are really there to clarify what candidates’ viewpoints are and educate voters…It will be interesting to see if the polls change as a result of this…just because it’s a pretty polarized elections, and people seem pretty set in their viewpoints and their opinions and who they voting for,” Rebecca Wertheimer, a sophomore in the 2016 Elections Politics class, said. In the face of such polarization, some students started to see vulnerability in American democracy. “It’s very odd—in a country that has been operating under democratic norms for some time—when you see someone questioning the legitimacy of that…Maybe for us [the debate is] a lesson on how fragile democracy is and how rhetoric can be dangerous to democracy,” sophomore Cody Hipskind said.